The UK is defined by the World Resources Institute as subject to ‘medium to high’ levels of water stress and as water scarce per capita. Annual rainfall is spatially variable, being in excess of 1000 mm per annum in parts of the north and west of the country, to below half that in areas of the south and east. Potential threats to water supplies in the UK are severe in the south-east of the country, including London. Most areas of the UK have experienced flooding in response to increased storm frequency and ferocity. 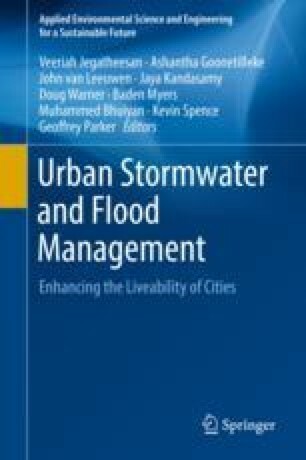 A criticism of water management in the UK is an over-reliance on a centralised supply system, coupled with a failure to expand the uptake of small-scale locally implementable techniques such as rainwater harvesting and grey water recycling. This represents both a risk to meeting supply demand and a potential hindrance to the mitigation of flood risk within urban environments. The UK has the opportunity to learn from the Australian system of ecologically sustainable design that includes strategies to supplement or substitute supply from a centralised system. It is discussed in this and subsequent chapters.